(MP106). Alma Claude Burlton Cull (1880-1931). Watercolour signed and dated 1911. Standard size: 15 x 9 ins (38 x 23 cms) approx. 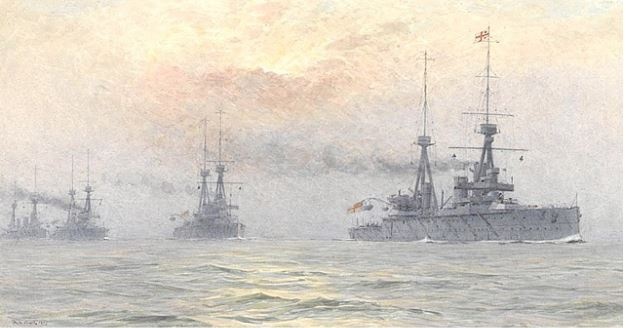 Cull was commissioned by the Ist Cruiser Squadron captains of 1911 to paint this watercolour for their departing squadron admiral, Sir Lewis Bayley. Entitled on the original mount “Press Forward” (taken, we are told from The Life of Stonewall Jackson and perhaps a favourite exhortation of the admiral’s!) it shows the battle cruisers, still then officially classified as mere cruisers, in line ahead. HMS INDOMITABLE (Captain A A M Duff RN) leads, wearing the flag of Rear Admiral Sir Lewis Bayley KCB CVO; and in line astern are HMS INFLEXIBLE (Captain C L Napier ADC RN), HMS INVINCIBLE (Captain R P F Purefoy MVO RN) and INDEFATIGABLE (Captain A C Leveson RN). The original mount (matt) of this watercolour gives a short history of the painting and its eventual presentation to the Maritime Museum (”in memory of the admiral, Feb 1939”). The painting reproduces quite beautifully and is another stunning example of Cull’s affinity with his subjects - the ships, the sea and the sky.